Step by Step Guide to Soundproofing Air Vents starting Today. One of the most common mistakes I see a lot of people make when soundproofing a house or an office is to ignore or forget about the Air Vents completely. This can lead to a severe unwanted noise coming through the ventilator. 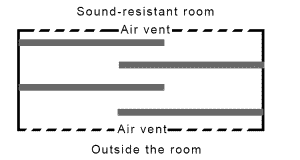 No matter how good you soundproof your room if the air vent is not soundproofed, The noise is going to go through it. Now that you understand the importance of soundproofing your Air vents, It is vital to know that there are two options to go about achieving that. You can completely block your Air vent Covers. Alternatively, you can opt for creating something named the Sound Maze. Don’t worry both methods work although completely blocking your air vent might have a more significant impact than sound maze method; Both ways will efficiently help you to reduce all the noise and sounds that comes through the air vents. Several things may cause a noisy heating air vents. Fortunately, there are many ways you can go about fixing that. Now let’s take a look at both methods so you can decide which one is right for you. Soundproofing Air Vents Using the Blocking Method. This method is the most effective and efficient of the two because completely blocking air vents will close the Air gap that you find in the Air vent to which normally a lot of undesired noise comes through. The only serious downside to this is during the warm season the room is highly likely to get hot. Unless you have an Air Con or Fan to keep the room temperature down when it’s summer. There a lot of ways to do this, but unfortunately some ways are more expensive and time-consuming, but in this guide, I choose the easiest and yet cheapest method. 3. Close the Air vent; This will make it look normal from the outside but completely soundproofed from the inside. To be honest, I have never built a sound maze to soundproof an air vent, But I went the extra mile for you, to do all the research and digging for you!. The image above shows you exactly how the sound maze should look like. I know it seems very intimidating and overwhelming, but once you follow this guide, you will see how easy it is. You will have to insert wood that is covered with soundproofing foam into the air vent then try to glue it like the image above. Using the pattern above the sound coming will be forced to move in a zig-zag pattern that which lowers the sound power as it tries to enter due to the wood covered in acoustic foam. This method should work well with reducing all the unwanted noise, but also the place will remain cool all year round. Cotton Foam: People recommend Silverstone Dampening Acoustic Silent foam. I Haven’t personally used it, but it has a lot of positive results from amazon.com( check it out). For soundproofing air vents you will also need about 1/5″ Plywood. A wood Cutter or saw. A handful of wood screws. This method may seem a bit complicated, Which is normal if you are not sure about how to do something type on google and I am sure you will find a lot of results, Just like I have when I was researching. Following this article will undoubtedly have a positive impact on lowering the sound coming through the air vents. I honestly hope you found this guide helpful and taught you a thing or two about soundproofing air vents. Don’t forget to see my other posts like. How to soundproof a wall and you can also check out soundproofing your car.